We carry out all types of spindle repairs. We remove the spindle and transport it to our premises. We assess the damage and its cause. After dismantling the spindle, cleaning it carefully and examining it visually, we measure all of the components that affect the flawless operation of the bearings using modern tools, make sure that they correspond to the required tolerances and prepare the appropriate measuring logs of the obtained measuring results. If needed, parts may be replaced or they may be reconditioned or manufactured by us. We only use quality products from well-known leading brands in bearings and other replaceable parts. High-speed spindles will naturally be balanced. We guarantee high-quality repair results through a condition monitoring measurement for bearings using the FAG Detector III instrument. Also milling head service with the same quality criteria! 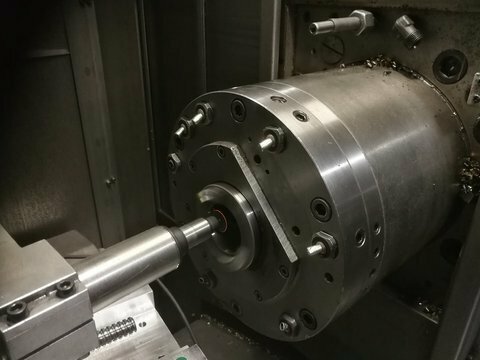 We also repair bearings of loop and main shafts in high-precision spindles with plain bearings and other applications of bearings, such as presses! We also grind spindle tapers with our self-made grinder, which allows us to grind the taper cost-effectively towards the machine.